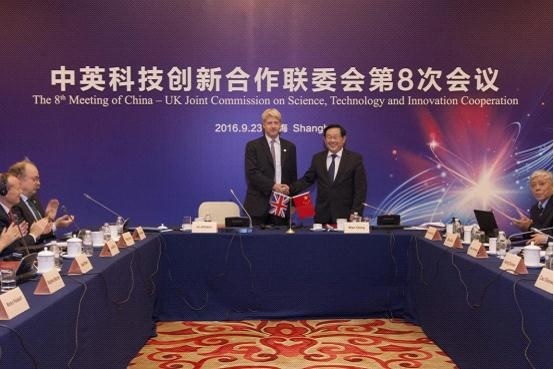 The 8th Meeting of China-UK Joint Commission on Science, Technology and Innovation (STI) cooperation was successfully held in Shanghai on September 23, 2016. The meeting was co-chaired by Wan Gang, Chinese Minister of Science and Technology (MOST) and Jo Johnson MP, Minister of State for Universities, Science, Research & Innovation. Wan Gang introduced the latest STI developments in China and relevant planning in the government’s 13th Five-Year Plan. Jo Johnson introduced the R&D expenditures and the reforms of S&T management system in the UK. The meeting reviewed the bilateral S&T cooperation since the 7th JCM. Both sides were satisfied with the practical cooperation over the past two years and determined the main modalities and key areas of cooperation in the next stage, including antimicrobial resistance, agriculture, food and water security, climate change, energy, urbanisation, big data and ICT, and space applications technology. Jo Johnson and Wan Gang witnessed the signing of a number of agreements, including Agreement between the UK’s Science and Technology Facilities Council and the Chinese Academy of Sciences to broaden collaboration between large scientific facilities, Agreement between Innovate UK and the Science and Technology Commission of Shanghai Municipality to cooperate in areas of mutual benefit, including exploring the opportunities created by future cities. Mr. Sunan Jiang, Minister Counsellor on Science and Technology from Chinese Embassy in the UK, attended the meeting.